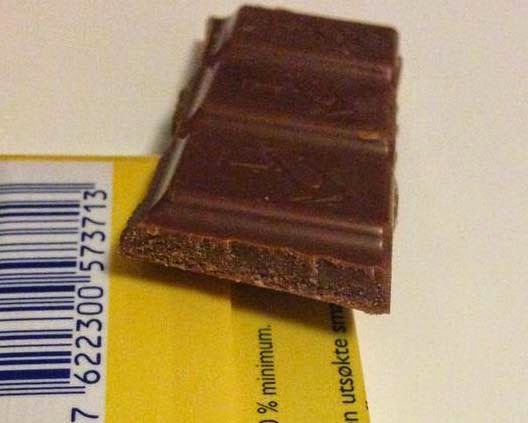 Melkesjokolade, meaning Milk chocolate off course, is one of Norway's most popular milk chocolates from the the country's biggest chocolate brand Freia. Freia is owned by Mondelez Int., which also owns Cadbury, Milka and Marabou of Sweden etc. Freia and Marabou shares mostly the same product range because ones they were the same company. Freia Milk chocolate is creamy but a little bit too sweet. After a bite it has some resemblance to those cheaper German advents' calendar chocolates (which isn't bad themselves, kind of a guilty pleasure). Overall an all right chocolate, but nothing fancy.